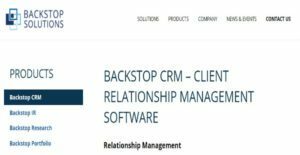 BackStop CRM is a feature rich Client Relationship and Communications Management software that provides a solid foundation for managing and nurturing client and partner activities. It also covers investment documentation, email communications and research materials using a central database that allows capturing and sharing notes, documents, calls meetings and more. The CRM synchronizes emails and contacts automatically with Outlook and allows users to easily access important information. Access can be restricted based on user type or roles for better compliance with internal organizational as well as external policies. Users can also access crucial information, add notes and manage contacts using their mobile devices from anywhere through the Backstop Mobile, which is available as an on-demand service designed for investors and fund managers. The CRM allows organizations to manage client relationships more effectively and provides a foundation for managing activities and communications. The sales management tools make it easier to track and maintain sales pipelines and other related activities, including interest levels, investment probabilities and client types. These tools help alternative asset managers manage their roles more effectively and integrate compliance into routine workflows. It watermarks fund-marketing documents, archives marketing emails and allows users to easily create and share analytics and reports for sales effectiveness measurement. The communication management tools help drive effective communications from customizable site portals and email campaigns. The email center allows users to create and send virtually unlimited email distributions to prospects, clients and other contacts. The success of marketing campaigns can be measured by monitoring message reads/forwards, which also helps ensure compliance. The secure and branded online portal works as a platform to distribute reports and statements such as fund documentation, K-1 etc. which protects businesses and their clients. Businesses can also take advantage of BackStop mobile, an on-demand service that allows fund managers and investors to make the most out of the CRM. BackStop Mobile also features many of the tools included in the CRM, including accessing crucial information, adding notes and keeping track of updates. This makes the solution ideal for fund managers that travel frequently and attend on-site meetings. Some of the other BackStop solutions include BackStop IR, Research, Portfolio, Portal, Accounting Investor, Accounting Portfolio and BackStop industry-specific solutions. It's essential to note that virtually no app in the CRM Software category will be a perfect solution able to meet all the requirements of all business types, sizes and industries. It may be a good idea to read a few BackStop CRM reviews first as some services might perform well just in a very small group of applications or be designed with a really specific type of industry in mind. Others can work with a goal of being easy and intuitive and consequently lack advanced functionalities needed by more experienced users. You can also find apps that cater to a broad group of users and provide a powerful feature set, but that in most cases comes at a more expensive price of such a solution. Ensure you're aware of your requirements so that you choose a service that offers specifically the elements you search for. How Much Does BackStop CRM Cost? We realize that when you make a decision to buy CRM Software it’s important not only to see how experts evaluate it in their reviews, but also to find out if the real people and companies that buy it are actually satisfied with the product. That’s why we’ve created our behavior-based Customer Satisfaction Algorithm™ that gathers customer reviews, comments and BackStop CRM reviews across a wide range of social media sites. The data is then presented in an easy to digest form showing how many people had positive and negative experience with BackStop CRM. With that information at hand you should be equipped to make an informed buying decision that you won’t regret. What are BackStop CRM pricing details? What integrations are available for BackStop CRM? If you need more information about BackStop CRM or you simply have a question let us know what you need and we’ll forward your request directly to the vendor.